suicide bullets: Dodonpachi - progress for that second loop! 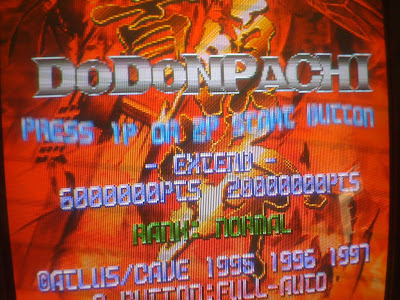 Dodonpachi - progress for that second loop! Man, I wish I had more time to work on this! I have been pretty busy socially lately and haven't been able to devote much time to DDP, but the time I have devoted has not been in vain. Numerous times, I have made the requirements for the second loop, only to have the wheels come off and lose like say, three lives on the third stage end boss or something equally silly. I have scored over 50 mil a few times now, gotten over 350 hits many times and I just need to have a day I can run through the game a few times in a row and make it happen! I am still suprised at the fact that I still enjoy the hell out of this game after so many credits on it. I usually get fairly bored after a while and move on, but I cannot get this out of the cab! That's because it is a quality game. I appreciated the art much more, however, when I was able to pause mid-laser and see each ship's unique stream. etc..
Yeah - it really is. In some ways, its the best of the old school (simple mechanics, classic shot types) and in others - the best of the new (chaining system, bullet hell spreads). As much as I love Toaplans efforts (and I really, really love them), I find myself addicted easily to early Cave titles. Got to get a DP board soon!